Sharan Anil Budhrani will exhibit his unique technique of action painting at Sikka Art Fair, from March 17 to 19 outside the Mawaheb studio. Van Gogh Live - the Experience: Created by Grande Exhibitions and presented by 61X Degrees Entertainment, this is a multi-sensory experience of Van Gogh’s masterpieces, giving viewers the sensation of walking into his world. It will run at Dubai Design District (d3) until April 2. Sikka Art Fair 2018: This is an initiative by Dubai Culture offering emerging artists from the UAE and GCC region the opportunity to showcase their talent. It will be held in the Al Fahidi Historical Neighbourhood from March 17 to 26. Among the 45 artists selected this year is Sharan Anil Budhrani from Mawaheb, an art studio for adults with determination. Budhrani was diagnosed with muscular dystrophy at the age of nine and is confined to a wheelchair. 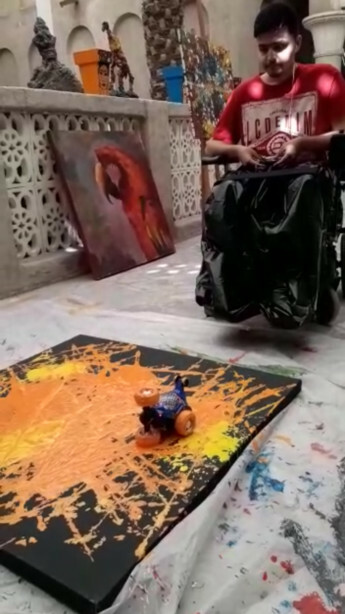 To overcome his limited mobility, he uses remote controlled cars, wooden spoons, sieves, threads, sticks and ropes to apply paint on his canvasses. Budhrani will exhibit his abstract expressionist paintings and demonstrate his unique technique of action painting at Sikka, from March 17 to 19 outside the Mawaheb studio. Mawaheb will also present an exhibition, titled Life is Beautiful, of affordable art and art objects created by its artists. Dubai-based artist Jessica Watson-Thorp will exhibit a series of spiritual ink monoprints of various mosques at the Shaikh Mohammed Centre for Cultural Understanding and London-based Palestinian artist Dia Batal’s exhibition, Between Lands and Seas, will open at XVA gallery. Visitors can expect to find interesting audio, video and interactive art installations, paintings, photography, sculptures, music performances, film screenings, poetry readings, workshops and more in the art spaces, courtyards and alleyways of this beautifully restored old quarter of Dubai. Art Week at Alserkal Avenue: The celebration will begin on March 19 with Galleries Night featuring the opening of new shows in the galleries on the Avenue, which will remain open until 10pm. It will continue until March 24 with artists talks, workshops, commissions, dance and music performances at various spaces. Alserkal Programming will present a commission by Turkish artist Hale Tenger and pop-up projects by Serendipity Arts Foundation, Athr Gallery, Iran/Africa, Fully Booked and Shaghaf Group. DIFC Art Nights: This will take place on March 19, from 7pm to 10pm in partnership with Dubai Culture under the theme of Bridging the Gap: between the local and global cultural scenes. The line-up includes art exhibitions and installations, live music performances and dining. New exhibitions opening at DIFC’s Gate Village art galleries include a special exhibition to mark the Year of Zayed at The Empty Quarter Gallery, featuring old photographs from the archives of Magnum photographer Bruno Barbey; and the first exhibition in the region by renowned Spanish artist Manolo Valdés at Opera gallery. World Art Dubai 2018: This is an affordable art fair featuring over 4,000 artworks from local and international artists and galleries at Dubai World Trade Centre from April 18 to April 21. Burj Khalifa LED Screening: The work of 10 selected artists and designers will be displayed on the façade of the Burj Khalifa throughout the Dubai Art Season. IWPA’s exhibition of works by women photographers: The International Women Photographers Association (IWPA) is presenting the work of the winner and 10 finalists of its annual international photography competition at La Galerie, Alliance Française Dubai. The show will run until March 31. Saqqakhaneh masters at Meem: A rare collection of works by modern Iranian masters associated with the Saqqakhaneh movement of the early 1960s is on display at Meem Gallery in Barsha.